Good morning, friends, and welcome to the Halloween edition of Kentucky Sports Radio. 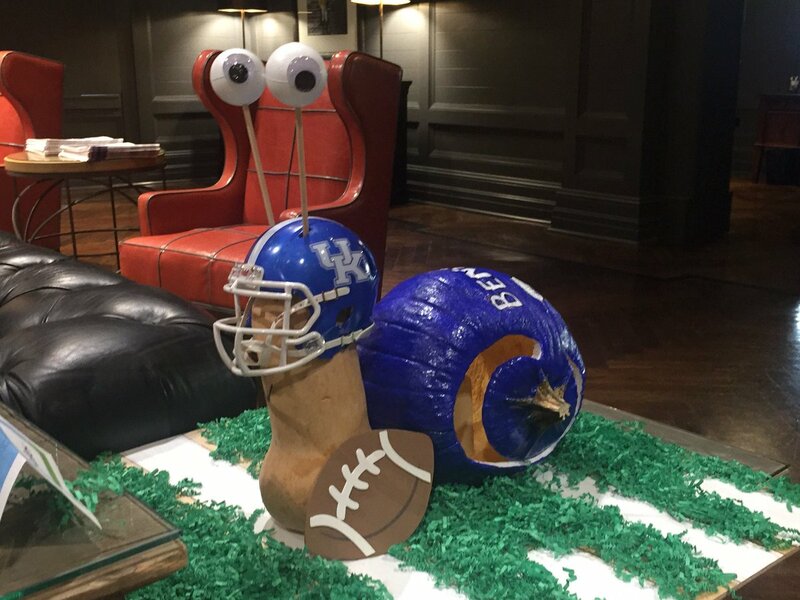 Today, the gang is at Clayton and Crume Leather Goods in Louisville to talk UK being ninth in the College Football Playoff rankings, the Georgia game, and general Halloween fun times. 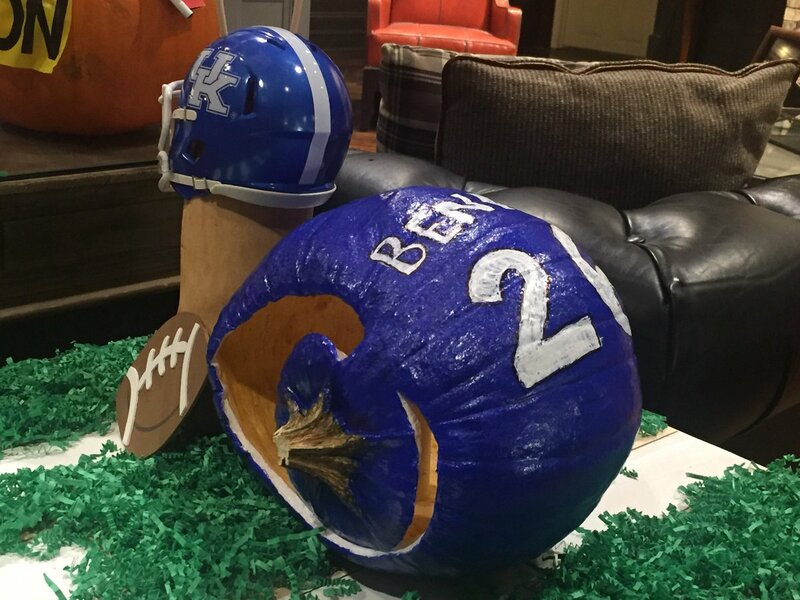 Speaking of, how awesome is this Benny “Snail” pumpkin Tony Neely shared on Twitter? We weren’t just on the list, we landed in the middle of it. Go Cats! Keep saying things to motivate our players, please. The summer after I returned from Nam was spent hiking across Western and Central Ky along the Ohio River. One day, late in the year, i came across a path through the dense underbrush; it led me some 400 meters along the river. At then end of the path was a clearing, ablaze with wild flowers; and there was a broken gravestone under a tree; it was faded white with age; but I could read the inscription. Her name was Analyne Wittich, the dates were Oct 23 1795-Oct 23 1812. She died on her birthday, and was 17. Beneath that were the words, “Suffer Not, A Witch To Live”. The day of my hike was October 23. We ARE beating UGA Saturday!!!!! I don’t want to be pinched. I just want to stay in this dream as long as I can! B-b-baby, you ain’t seen n-n-nuthin’ yet. One of my favorite bands, largely (if not exclusively) from my wife’s home town of Winnipeg. And we’ll be takin’ care of business, every day. Galloway is just upset we are ranked above Ohio State in the Playoff Rankings…reality check. We should be. OSU got walloped by Purdue. And Purdue is 4-4, and lost to Eastern Michigan. That was an absolute beat down. I never watch OSU but I watched the end of that game and loved it. He also may not like the recruits we’re getting from Ohio. If that’s the case, I don’t understand, because OSU is still getting the pick of the litter up there. Mizzou beat Purdue at Purdue just like Eastern Michigan did. OSU lost by 29 at Purdue….nuff said. And, I think Clay Travis is a UT fan; hell, even their bluetick coonhound is depressed. I can’t believe what’s going on . Thank you Football Gods for finally releasing the Bryant curse. I had never heard of CT before yesterday. Iamhe, CT was the clown that once asked Tim Tebow if he was still a virgin. People should just ignore him and what Galloway said. They’re looking for attention and if you react they’re saying “Score!”. CT also said when W. Virginia played in the Motel 6 Bowl, that their fans couldn’t afford to stay there. CT is basically a professional troll at this point. I don’t know if he started out that way, but that’s the situation now. Why do they still encourage him? I don’t know. Each song is worse than the last. It’s kind of like the Gong Show of radio. ^ But without the gong. Ha! Good point Clutch. Matt needs to get one if he’s going to let him continue. Matt’s taste in candy is much like his taste in music and word pronunciation. I’m surprised he didn’t mention horehound candy. I was away for a while. What candy did he mention? Iamhe, that would be the candy in the Card bball dorm. Horehound candy plus honey and bourbon is a good home remedy for cough. Also when you cut your finger… tastes good when you lick your finger. Bah ha ha ha Chris! I caught that, Chris…ha ha. Smarties in Canada are a Nestle version of M&Ms. That’s an old country remedy runnin, but isn’t that alcohol abuse?? Just saw your comment on on horehound candy Chris…hillarious! If by “alcohol abuse” you mean adding candy and honey to it, I believe it is. Dude, Georgia is not going to score 42 on us. 42 is practically 3 games worth of scoring on our defense. It’s NOT happening. Fromm has poor reaction to the pass rush; 11 interceptions in two years, and 0.6 rushing yds per carry. Yeah I’m more worried they bring in the Freshman QB. I like our chances much more if Fromm is their QB and he is not the runner QB that could hurt us. If we can somehow, some way, score about 30, I love our chances. If we can score 24, I like our chances. Ha Ha Ha Ha delirium.